University of Nebraska Press, 9780803232310, 194pp. Farmers and pragmatists, hardworking people who made their way west from Kentucky through Ohio and Indiana to settle at last in southern Illinois, Lee Martin’s ancestors left no diaries or journals or letters; apart from the birth certificates and gravestones that marked their comings and goings, they left little written record of their lives. 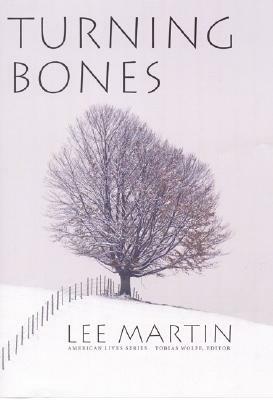 So when Lee, the last living Martin, inherited his great-grandfather’s eighty acres and needed to know what had brought his family to this pass and this point, he had only the barest of public records—and the stirrings of his imagination—to connect him to his past, and to his beginnings. Turning Bones is the remarkable story brought to life by this collaboration of personal history and fiction. It is the moving account of a family’s migration over two hundred years and through six generations, imagined, reconstructed, and made to speak to the author, and to readers, of a lost world. A recovery of the missing, Turning Bones is also one man’s story of love and compromise as he separates himself from his family’s agrarian history, fully knowing by book’s end what such a journey has cost. Lee Martin is an associate professor of English at Ohio State University. He is the author of Quakertown, From Our House, and The Least You Need to Know.